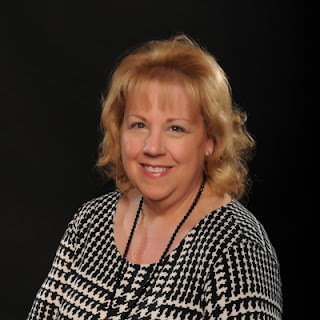 LUCY BURDETTE: I met Denise Swanson years ago at the Bouchercon world mystery convention in Milwaukee. Denise was a newly published author and I was desperate to follow in her footsteps. Now here she is fourteen years later, a New York Times bestselling writer with two series! I knew you'd want to hear about how she does it...welcome Denise! DENISE SWANSON: Some authors write three, or four, or even five series, and although my hat is off to them, I have no idea how they do it. Just the physical act of writing as much four hundred thousand words a year boggles my mind. Then there’s coming up with plots, keeping all the characters straight, and making sure that each storyline is unique. Thinking about it makes my head swim. Which is why, I feel like a total wimp when I confess that writing a second series scared me to death. I’ve been writing the Scumble River mysteries for thirteen years, bringing out my fifteenth book, Murder of the Cat’s Meow, last September. I knew my setting and characters and was extremely comfortable with the process. But in 2011, my agent and editor suggested (okay told me) that now that I was no longer working as a school psychologist, it was time to be a more productive writer. Yes, those were their exact words and I’m pretty sure they rehearsed their speeches. So after much gnashing of teeth, I admitted that a fictional woman named Devereaux Sinclair had been nagging me to tell her story and maybe, I could write a second series. Dev, as she assured me everyone called her, lived in Shadow Bend, Missouri, and owned an old-fashioned dime store. She lived with her grandmother Birdie, and she had two BFFs. Poppy Kincaid, a beautiful bad girl who owned Gossip Central, the local nightspot, and Boone St. Onge, a lawyer who handled mostly real estate and divorces. With those facts in mind, I started writing the first Devereaux’s Dime Store mystery, Little Shop of Homicide. Since one of my biggest fears was that readers and reviewers would find my two series overly similar, I was careful to make Dev everything Skye wasn’t. Dev embraces all modern electronic gadgets, while Skye can barely work her cell phone. Dev never wanted to leave her hometown, while Skye fled Scumble River at eighteen and only came back when she was broke. Dev was an investment consultant before buying the dime store and she wouldn’t dream of working in a “helping” profession, while Skye is a school psychologist who always wants to do the right thing. Yes, Dev and Skye both live in a small-town, are curvy women, and tend to find dead bodies but that’s where the resemblance ends. Now after writing the second Dime Store book, Nickeled-and-Dimed to Death, I have to admit that there is one more similarity between my two sleuths—they both have two hunky guys in their lives and can’t decide which one they really love. I guess that’s not too bad a problem to have. How many of you wouldn’t like two hot men vying for your affections? Or maybe I should ask how many of you have been in that situation? 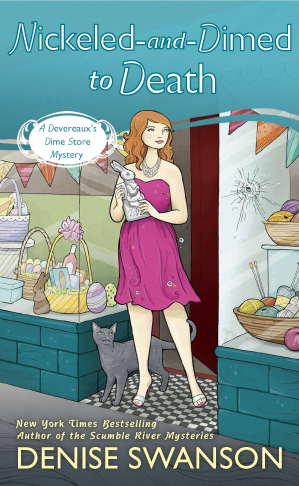 New York Times Bestselling author Denise Swanson writes the Scumble River and Devereaux’s Dime Store mystery series. Her newest book, Nickeled-and-Dimed to Death, debuted March 5. LUCY: Thanks for coming over to visit Denise--and using 500 words up on Jungle Red writers. Reds, she'll be stopping in all day to chat with us, so bring on your questions! Denise, moving on to a new series is a big step for you and kudos on that! I know it isn't easy. I'm now writing the 3rd book in my series and I can't possibly imagine what it might feel like to let go of these characters who I live and breathe with every day. I wish you the best of luck in your new adventure! I only recently discovered the Scumble River series, and I love it! Only my budget--and my family's desire for some attention--has kept me from reading all of the books, as quickly as possible. Can't wait to meet Dev, now! Great post, and thanks for sharing. Thanks, Terri! But actually I'm continuing to write my original series, as well as writing my new one. Thanks, Lexie's Mom! Hope you enjoy Dev as much as you like Skye! Denise, will you tell us more about how you balance writing the two series? Do you write the books all in one time chunk, or are you constantly have ideas for both at the same time? The Scumble River series was one of the first in the cozy genre that I tried and I instantly feel in love. I look forward to meeting Dev, while reading the new series. Four hundred thousand words a year. And yes, I'd love to know more about how your mind works! I love that some of the action takes place in a dime store. I fondly remember JJ Newberry where it smelled like burned grilled cheese sandwiches and Aquanet. Thanks, Kristopher! Hope you like Dev as much as Skye. Hank, no not me! ;) I could never write that many words a year. I meant the authors who have 4 or 5 series going. Although I never attempt to write on both books at the same time, I do constantly have ideas for each series. I have two folders and use sticky notes to remember what I want to include. A dime store is a wonderful place for a story of any kind. My first job ever, other than baby sitting, was in a Woolworths in Dallas Tx. I loved it. If I remember correctly I spent nearly every cent I made buying things that I simply could not live without. I look forward to finding that book and falling in love. Yes, I worked in a dime store, too! G.C. Murphy's. Summers,when I was..oh, 17 and 18. I LOVED IT. I worked in the candy dept, and the record dept, and....Millinery! How great is that? I love both series, especially since they don't take place in the same time era. Will the ladies settle down one the one guy? You mean, you're writing two series -- at the same time? Dru--yep eventually both women get their happily ever after guys. But the key word is eventually! Reine--yes, two at once. My mind spins most of the time. Still giggling. I've seen Denise in person several times (and she puts on a great signing! ), so I can "hear" her voice as I'm reading this post and her replies. I'll never be any competition: I can't plot my way out of a paper bag for a short story, much less two full length seris at one time. I'm lost in wonder and awe.